The proven design of the Sta-Rite Signature 2000 borehole pump range is precision engineered to provide efficient and reliable performance. The use of specially selected materials such as the "harder-than-sand" ceramic wear surface combined with floating impeller design provides trouble-free operation and ultimate sand handling ability. Designed and manufactured by Sta-Rite USA, these pumps have proven their reliability in many countries - Worldwide. Demanding requirements call for uncompromising pumps. Which is why our range of chemical pumps can be used with acid, alkaline and even some solvents. They use the latest 'hi-tech' polymers and special mechanical seals which are compatible with the liquid to be pumped. All our chemical pumps feature heavy-duty, totally enclosed fan-cooled motors and are designed to achieve a completebalance between hydraulic and electrical design. Column and self priming models are suitable for soluble and synthetic based oils. Manufactured from high grade cast iron steel, our coolant pumps conform to CNS requirements. Available in 1 phase and 3 phase units. These little units were specifically designed for pumping water onto the fins of an evaporative cooler. Being a single phase unit they are also very popular for use as machinery coolant pumps, for lathes, milling machines and cooling fan units etc. The SMH series stainless steel multi-stage pumps features the exclusive DROP (Dry Running Operating Protection) system to prevent damage if accidental Loss of Prime (LOP) occurs. Combining the SMH pump and Presscontrol constant pressure control provides a low compact profile which can be located in confined areas with optimum constant pressure performance. Modern-design noiseless high-efficiency pumps, available in the HM version for domestic applications and in the HMS version for industrial applications (made entirely of AISI 316 stainless steel). The HS-series is a single-phase, portable dewatering pump with a spiral pump casing that allows sand and silt-laden water to pass through the pump easier than any other pumps of this class. The shaft mounted agitator prevents "Air Lock" that tends to take place on vortex or semi-vortex pumps. KTZ-series is a three-phase, cast iron, high head dewatering pump. High head or high flow versions are available in every motor size. Greatly increased maximum submersion depth possible due to the mechanical seal's resistant to high pressure. 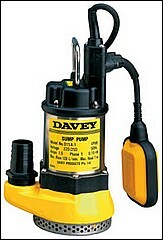 Top mounted outlet makes pump suitable for installation in confined spaces. The LH-W-series is an extra high head series of the LH pumps having two pump stages with chromium iron closed impellers. The centre-flange construction balances the pump and enables it to be lifted up/down without disconnecting it from piping. The UZ-series is a vortex pump driven by a 4-pole motor. It has a large solids passage that is equivalent to its discharge diameter giving it excellent solid handling capability. It offers practically choke-free operation in sewage pumping. 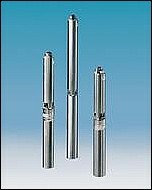 Submersible pumps with entrained solids. DOMO series electric pumps are available with twin-channel or vortex impeller (DOMO VX). Designed to handle suspended solids up to 50 mm in diameter. Submersible pumps for dirty water manufactured in AISI 304 stainless steel. Head up to 20 metres, delivery up to 425 l/min. DOC pumps are versatile, corrosion-resistant and compact. Three basic versions are available with 0.3 to 0.7 kW power. Laser-technology welded centrifugal pumps. Designed to handle hot, cold and moderately aggressive liquids. 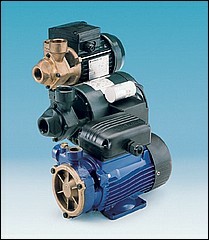 Wide range of pumps for domestic and industrial applications. Single-impeller and dual-impeller models available. The OCS400 range of pumps are manufactured from AISI 304 grade stainless steel (Model OCS403 is also available in AISI 316 stainless steel). Product quality is assured through the use of a unique pressing system that ensures all hydraulic components are uniform in construction, greatly improving corrosion resistance and performance. Typical applications for the OCS400 Series are: Domestic and commercial water transfer, Cooling towers, Aquaculture, Horticulture and larger horticultural ventures, Dairy hosedown, Dairy vat washing and Irrigation. The OCS Series Stainless Steel Centrifugal Pumps are suitable for water and mild chemical applications. Quality is assured through the use of a unique stamping process of both the voluted casing and baffle. Only the highest quality AISI 304 stainless steel is used in all wetted areas. Couple these to the heavy duty industrial motors you have a pump which is ideally suited to the rigorous demands of modern industry. These pumps are built to ISO2548 classification. Typical Applications are: Domestic and commercial water transfer, Cooling towers, Aquaculture, Horticulture, Irrigation, Dairy hosedown and Dairy vat washing. Award winning designs, manufactured in Australia to provide the high pressure transfer of water.